In 2018, a combination of uncertainty in the face of highly disruptive trends—globalization, technological change, demographic shifts—and new leadership among the region’s business, government, and civic organizations motivated stakeholders to take a fresh perspective on the regional economy, defined as the six-county Sacramento region. The Sacramento region is relatively prosperous compared to other large metro areas, but the region has been on a troubling economic trajectory since 2006. Compared to the rest of the nation, the Sacramento region is relatively productive and prosperous; middle class earnings are higher in the region as is worker productivity. Notwithstanding this strong starting point, the region has struggled over the past decade. Between 2006 and 2016, the Sacramento metropolitan statistical area (MSA) ranks in the bottom-third of the 100 largest metro areas in composite rankings measuring improvements in growth, prosperity, and inclusion, three critical elements of regional economies that work for everybody. 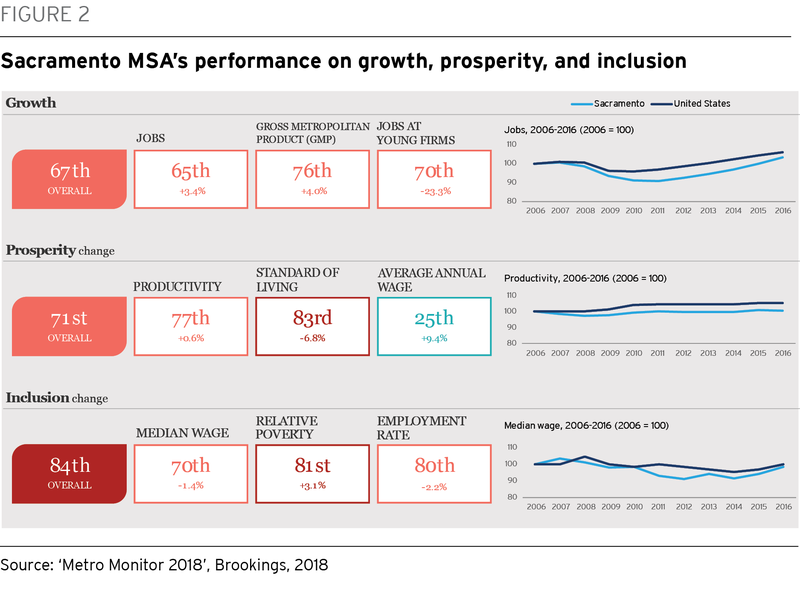 These long-term trends reflect that the downturn during the Great Recession was deeper and more sustained in the Sacramento MSA than in other parts of the nation. As a result, the region’s economic performance has looked better over the past five years. This progress notwithstanding, 34 percent of the Sacramento region’s residents live in struggling families, defined as residents in households that do not earn enough to cover their basic household expenses. Nearly two- thirds of the region’s residents without a high school degree are in struggling families, as are 47 percent and 42 percent of black and Hispanic residents, respectively. Tradable industries: Tradable industries are critical for local prosperity in their ability to improve productivity and bring in wealth from outside the region. Therefore, one notable challenge for the region is that employment growth in tradable industries has trailed the nation as a whole, suggesting competitive deficits. Partly due to these trends and partly due its role as a government capital, exports account for a lower share of economic output in the Sacramento region than in any other peer region. Most of the region’s job creation, therefore, has been in locally serving industries such as health care and transportation and logistics, parts of the economy that do not pay as well as advanced manufacturing and tradable services. More optimistically, the Sacramento region has a notable traded cluster opportunity at the intersection of food, agriculture, and technology. Innovation: The Sacramento region has clear strengths within the early stages of the innovation pipeline. UC Davis stands out as a globally relevant innovation asset, due to its contribution to research and development, patents, and licenses, especially in the fields of agricultural and biological sciences. Innovation is occurring in other sectors and companies but, relative to other regions, these are the clearest advantages. The challenge for the Sacramento region remains translating research and development and patenting into new firms and, eventually, good job growth. The region trails its peers on measures of business dynamism, venture capital investment, and advanced industries growth, suggesting the need for further actions to support key advanced industry clusters and help young innovative firms start and scale. Talent: By national standards, the Sacramento region has a relatively strong base of educated workers. But its labor market is changing due to two significant transformations. First, employers are demanding and rewarding workers with higher education and technology-relevant skills. The share of the Sacramento region’s jobs requiring minimal digital skills has decreased from 53 percent in 2002 to 28 percent in 2016. Second, the Sacramento region’s workforce supply is becoming much more racially diverse, which makes closing educational and employment disparities by race extremely urgent. Notwithstanding the region’s ability to attract well-educated workers from outside California to fill workforce gaps, it must educate and train a broader, more diverse set of its homegrown population for in-demand jobs. Infrastructure and built environment: The Sacramento region’s employment base concentrates in fourteen job hubs, which together hold 41 percent of regional employment. Businesses that locate in the region’s most accessible and connected job hubs—particularly those in the core and near transportation corridors—have advantages in the number of workers that can reach them in a reasonable commute. Therefore, from a spatial efficiency perspective, it makes sense to prioritize business development in these more accessible nodes. Most workers commute via automobile, although at lower rates than regional peers. Meanwhile, new housing starts are occurring in areas north and east of the region’s core, the vast majority of which is single-family housing. As housing development occurs further from the core, the region’s geography of opportunity remains uneven, exhibited by neighborhoods with high levels of concentrated poverty and low levels of digital broadband adoption. Governance: The Sacramento region is operating in a higher-tax, higher-regulation environment, which is partly due to decisions made at the state level. The region also has high levels of government fragmentation—due to the preponderance of many special districts. Addressing these two issues will only occur through public sector reforms, but governance also refers to the quality of private and civic institutions, and specifically their ability to work with government to help advance regional economic priorities. In this respect, there is clearly momentum on the part of many organizations in the Sacramento region to overcome existing fragmentation of economy-relevant initiatives and investments. The Sacramento region’s leaders have an opportunity to organize and invest in its economic future. As they undertake that process, this assessment concludes with high-level strategic considerations in three key areas: business and industry development, talent development, and spatial development. Explore the potential for a cluster initiative at the intersection of agriculture, food, and science and technology, a promising tradable cluster opportunity. Identify and address gaps that hinder business dynamism. While we identified that young firm growth is not as robust in the Sacramento region, more work needs to be done to identify the specific reasons why young firms may not be starting and scaling locally. Invest in digital skills training, to both grow the pool of high-skill technical workers and expand the number of workers with basic digital literacy, by making digital skills a shared priority for community colleges, universities, and workforce and economic development groups. Prepare and connect young workers, especially young workers of color, to in-demand occupations and industries through alignment between talent development systems and economic development systems. Factor in job access to economic development activities such as business attraction and expansion. Factoring in job accessibility could connect economic development goals and specific site selection activities to the goals of the region’s spatial planners. Factor economic objectives into spatial planning. Meanwhile, the reverse approach is also useful: a confluence of trends—development in the outer parts of the region; rising unaffordability; and several major potential transformative physical developments—provide an opportune moment for spatial planning leaders to engage in a new round of land use planning from the perspective of the region’s economic objectives. These considerations purposefully remain at a broad level, as the scope of this market assessment represents only the start of what will be required for the Sacramento region’s stakeholders to achieve the economic aspirations of the region. Subsequently, the region should vet these ideas and others through local partner insights; broader civic engagement and capacity-building processes to promote local ownership, organization, and commitment to implementation of responses; and final strategy development yielding a plan and operational document. While only a first step, this analysis makes a clear case for the Sacramento region’s leaders to take on the difficult but important civic work to assure sustained growth and prosperity. This analysis makes a clear case for the Sacramento region’s leaders to take on the difficult but important civic work to assure sustained growth and prosperity.